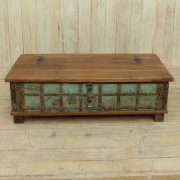 Vintage Indian teak trunk with bone inlay in nice patterns. 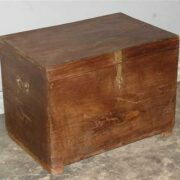 We have a selection of these gorgeous vintage Indian teak trunks. 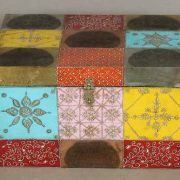 Each one has been refurbished and inlaid with camel bone by a local Indian craftsman in traditional Rajasthan patterns. They all have a scalloped base, brass lock clasp and hinges, metal side handles to make carrying easier and are raised on feet. Inside some is a small side compartment under the lid, with a deeper semi-secret compartment below it. As each one is unique sizes and inlaid patterns vary slightly. Please call or email if you would like individual photos and dimensions, or to choose a specific one. 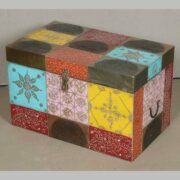 This item is in stock in our furniture shop in Brighton & Hove, Sussex.